Known for its durability, insulation, sustainable and aesthetic qualities cork by Amorim Cork has found application in décor and design in all corners of the globe. In its latest creative application, Amorim Cork is now being used in an über-cool and innovative design called Skulpod, an igloo-style modular structure conceptualised and designed by South Africans Nouschka Očenášek and Ryan Ashworth. Skulpod taps into the modular home trend, which uses a system of smaller parts to create a composite structure sturdy enough to function as a house. Modular homes have surged in popularity due to a range of benefits which includes cost reduction and flexible design and augmentation – however, often the separate parts used in the construction of these type of units are heavy and cumbersome, making assembly impossible to do without the need for heavyduty machinery or a team of experts. 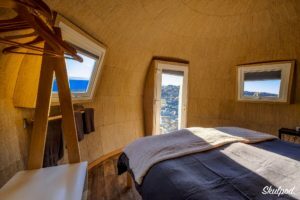 Nouschka and partner Ryan recognised a gap in the market: Ryan, trained in construction, was traveling extensively to Antarctica to set up ‘glamping camps’, where the unwieldy designs showed an apparent lack of sensitivity to the environmental and physical realities. It was difficult to erect in extreme climates, and both Ryan and Nouschka, who is a trained interior architect, thought that there had to be an easier way. Using the same composite materials that yachts are made from, the pair played around with designs to create a sturdy shelter that would create a safe environment for inhabitants and be easy to transport and assemble. In addition, the shelter had to have sustainability at its core, with no damage to the environment during the manufacturing process, or permanent traces once disassembled. Nouschka says that everything had to work in perfect unison to create the perfect modular home. Apart from being light and impermeable, internal wall coverings had to provide thermal and acoustic insulation, provide a barrier against fire, be durable and be aesthetically pleasing. The designers considered various materials to find the best, and after intensive research and validations, “easily” decided that cork would be the best. “It naturally has all the components that we needed for Skulpod. It is a sustainable, durable material, and by using cork we also contribute to the environment. Cork is naturally beautiful, so it doesn’t need paint laced with chemicals. We also liked the idea that no cork trees are ever ‘felled’, but just stripped of the outer layer of bark every few years. The cork forests also retain greenhouse gasses, so in a way, we are contributing to nature, instead of taking away,” explains Nouschka. 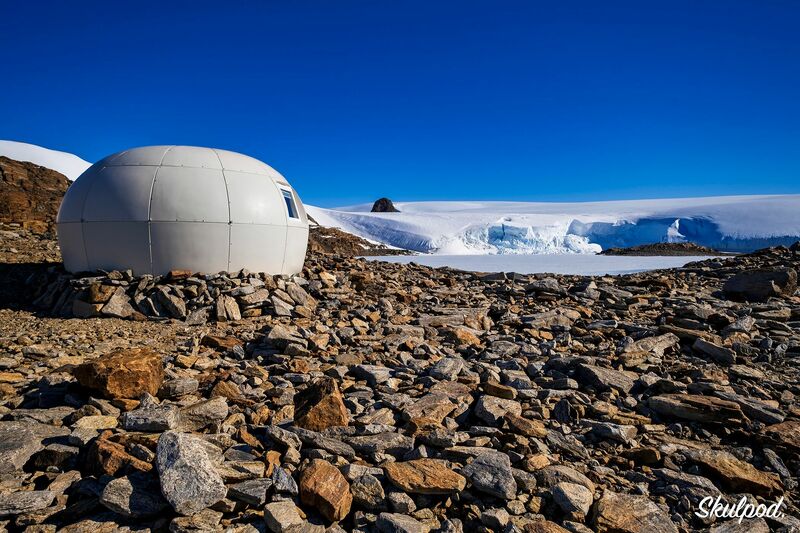 So effective is this structure, that a Skulpod shelter has been erected in Antarctica, where it comfortability withstands extreme climates. Amorim Cork provides Skulpod designers with cork material for their design purposes. Offcuts are recycled to ensure nothing is wasted. An objective Amorim Cork is proud to be associated with.